Goulash is one of the most delicious meat dishes. It is suitable as a main dish for lunch or dinner, but they can also be surprise guests on the occasion. Goulash can be cooked in different ways from different types of meat. To prepare stew of beef, prepared meat, remove the bone and slice at the rate of six to eight pieces per serving. Add salt, sprinkle with flour. On a very hot fat, fry the pieces of meat on all sides and place in a saucepan. In the remaining fat saute the chopped onion in rings and along with the fat transfer to the pan with the meat. Add a little water and cook by closing the pan with a lid. The tomato paste fry with the red pepper 20 g of fat, add the meat and continue to simmer for a few minutes. 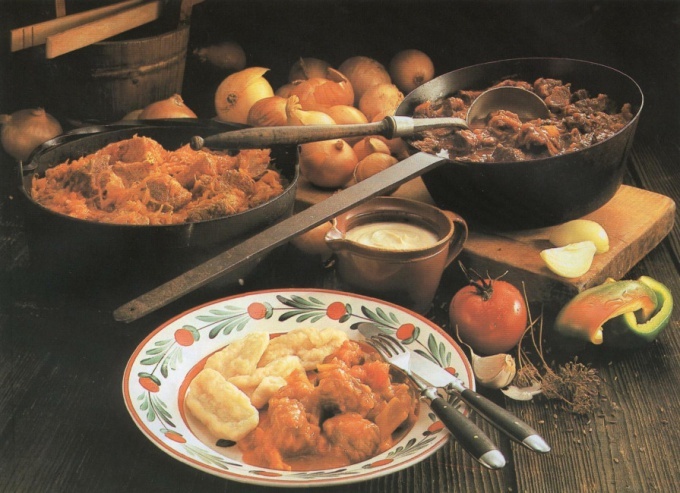 Serve goulash on a round dish with dumplings. To cook goulash in Hungarian, cut into slices the onions, crush the garlic and sauté together until Golden yellow color. Then add the tomato paste, put the meat, diced, fat, sprinkle with red pepper and pour in a little water. Simmer the goulash in a sealed container until then, until the meat becomes soft. If the water evaporates too quickly, it is necessary to refill. At the end of quenching add the cumin, lemon peel, salt and pour sour cream. Goulash can be prepared from rabbit guts. For this front split Mature hare and blade, cleaned from the films, rinse and chop into small pieces. Lungs, heart, purified from the film liver cut into strips and fry with pieces of rabbit in a cast iron pan. Add the sliced sausage and onions. Add 1 Cup of water, add salt, spices and simmer on low heat until tender. At the end of sautéing, pour mixed with flour, sour cream, boil, add salt to taste.